Middle Eocene primates of 50-125 g, it is much more probably primitive for primates, and also for simiiforms. A reappraisal of the tarsal characters of the Shanghuang primates is beyond the scope of this chapter. However, a few other characters need to be mentioned. The more salient sustentaculum of the "protoanthropoid—new taxon" projects medially to a greater degree than in the other taxa, rendering this calcaneum wider than the others. This character is said to be especially "platyrrhine-like" by Gebo et al. (2001). However, it is also Ptilocercus-like, and evidently primitive. The short distal part of the calcaneum of the "new protoanthropoids" is also Ptilocercus-like and probably primitive. The very circular shape of the calcaneocuboid joint in eosimiids is Ptilocercus-like, and thus could be primitive, whereas the removed wedge on the plantar side is derived and appears as one of the rare derived anthropoidlike features of these tarsals. 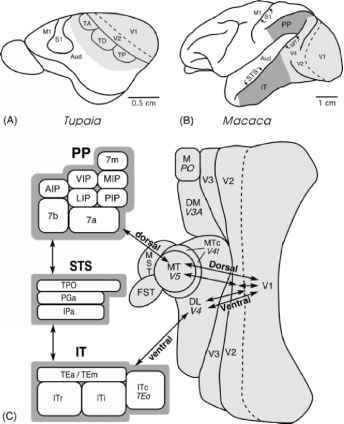 The small Shanghuang tarsals are exciting because they document some new primitive tarsal characters that must be included in the primate morphotype (because primitive characters are not indicative of phylogenetic affinity, their link with simiiforms remains weak). Their comparison with Ptilocercus should enlighten our understanding of early primate locomotor evolution and phylogeny. It is the conviction of this author that leaping and climbing specializations are more accentuated in prosimians, which are derived for the related characters (and many parallel acquisitions of these characters are to be expected during the early radiation of primates), whereas the more quadrupedal eosimiids and "new protoanthropoids" are more similar to Ptilocercus, and more likely approach the primitive primate morphotype. Simiiforms are likely primitive for many tarsal characters; however, tarsals from early simiiforms (= "telanthropoids") will be critical to test this hypothesis (the posterior astragalar shelf present in Ptilocercus and eosimiids needs further study; its absence in simiiforms might be derived). Let us simply add that the simiiform ovoid entocuneiform facet for the first metatarsal is more likely to be derived from a more primitive (? ptilocercine-like) morphology than reverted from the prosimian sellar joint (contra Szalay and Dagosto, 1988). Entocuneiforms might be too small to be found in eosimiids; however, first metatarsals when found should test these ideas. In sum, the primitive reference offered by Ptilocercus and the eosimiid tarsals lead to further question the leaping component of the grasp-leaping theory and to favor a hypothesis of rapid grasp-quadrupedalism for the primitive primate morphotype locomotor mode. This would be associated with insect manual catching. This hypothesis avoids multiple postcranial character reversals in the origin of simiiforms and considers leaping features as apo-morphies developing in prosimian groups. This sketchy view should be expanded in much more detailed scenarios (see Dagosto, this volume).